This afternoon I read Way to Be! by President Gordon B. Hinckley. As I pulled it off the bookshelf, I noticed numerous Post-it Notes sticking out the side and remembered a month I had forgotten about. Around 2003, I read this book in preparation for a talk I had been asked to give in church on the subject—the “nine Be’s” that help you “be happy and make something of your life.” Since I was preparing for the talk, I realized I may mark the book different from what I would have if just reading for myself, so I opted to use sticky notes to mark potential passages I could quote for my talk. Shortly after my talk, I told a friend how good the book was, and she asked to borrow it. I explained about the Post-it Notes. 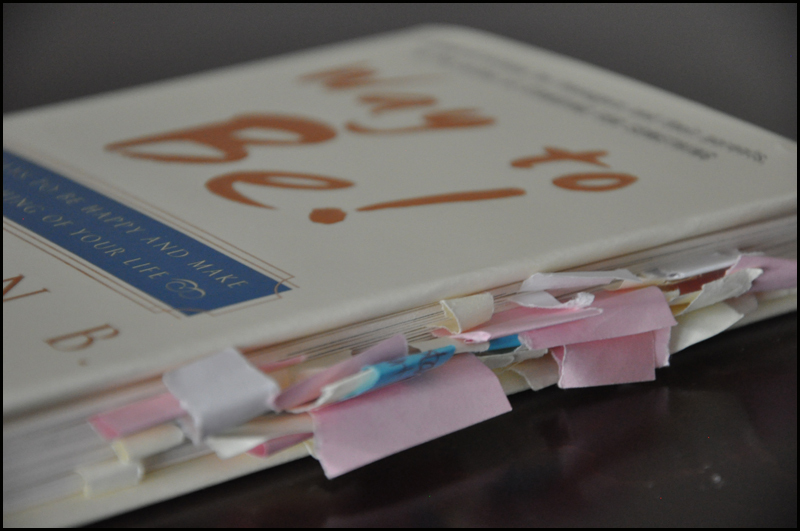 She ended up marking the book with sticky notes as well, and mentioned that it was like having a piece of her left with the book. I loved that idea, and I never removed either set of sticky notes. Years later, I love having those notes. They not only remind me of a great friend, but they also capture a piece of our lives—of what was important to us at that time and what words of advice, knowledge, and comfort spoke to our souls. Just as my friend Jessica left stick notes in my book with lessons important to her, I think we constantly leave unseen sticky notes in one another’s lives. I can immediately think of several lessons people have given me throughout life. And just like the notes in this book, I can continue to call upon those sticky-note lessons and the impact they left on me. (2). Meditate on the unseen sticky notes I’m leaving in the lives of others, and make sure the notes I’m leaving are positive ones left with care and love. And with that, I’m off to ponder. This entry was posted on Sunday, August 1st, 2010 at 8:52 PM	and is filed under Books, People, Relationships. You can follow any responses to this entry through the RSS 2.0 feed. You can leave a response, or trackback from your own site.